Dahab, the pearl of the gulf, is situated between Sinai’s mountainous landscape and the Red Sea’s prestigious shoreline. 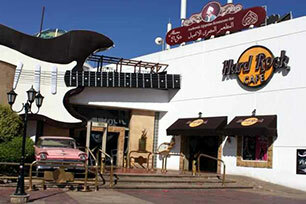 Dahab, which means “Gold”, is named for the town’s spectacular beaches, sandy coastline, and its peaceful atmosphere. Dahab is globally recognized as a splendid setting for windsurfing, owing to its natural atmosphere of reliable winds and flat water conditions in its sand spit. With its magnificent dive sites , Dahab is the city which will bring you closer to the thrilling diving experience of your dreams. 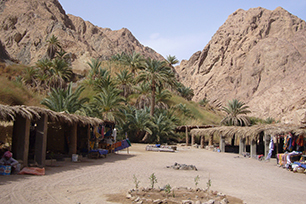 Predominantly a Bedouin enclave at its heart, visiting Dahab will be taking you on a journey to discover the Bedouin’s fascinating traditions and lifestyle, in addition to a Bedouin dinner. This also makes it a preferred base for desert excursions into the interior deserts, as well as to the lofty heights of the nearby Mount Sinai. 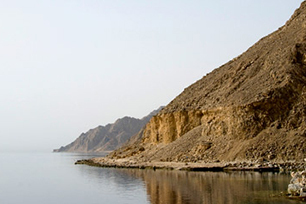 You can also discover the beauty of land and sea by visiting Abu Gallum National Park. Also on dry land, Wadi Gnai is a perfect spot for rock climbing enthusiasts, or simply a beautiful oasis in which to enjoy a pot of tea. Dahab’s main city is Assala , the most developed conglomeration of campgrounds, hotels, shops, and bars that lie along the seashore. A few miles south of Dahab lies the beautiful adventurous spots of Qnai El Rayan and Qnai El Atshcan valleys. With its charming combination of local Bedouin culture, magnificent landscape, gorgeous mountain and sea views, Dahab is considered an ocean-side refuge from the unrelenting heat of the desert. Beaches in Dahab are pristine and plentiful. 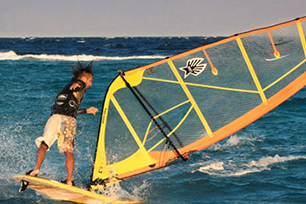 The reliable, strong and clean winds of Dahab also make it a very popular destination for windsurfers flocking to the sunshine in the winter months. On average, Dahab gets 300 days a year of wind above Force 4, so both Windsurfers and Dinghy sailors will appreciate the consistently breezy, yet sheltered bay. The temperatures in the summer can reach as high as 40°C but the humidity is generally low. 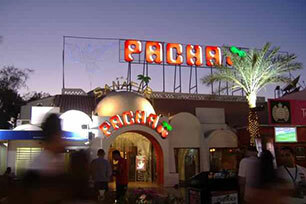 Most Dahab hotels usually have their own private beaches exclusively available to hotel guests. 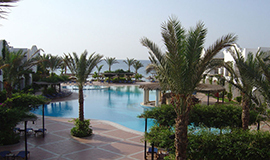 Hotels and resorts in Dahab also offer a large choice of relaxed watersports and sea related activities, from banana rides to snorkelling excursions, pedal boats, canoeing, catamarans, and glass-bottom boats. Some resorts offer also parasailing. Jaz Dahabeya is situated directly on the sandy beach of the natural lagoon by the Red Sea resort of Dahab, just a one hour drive from Sharm El Sheikh International Airport and only two hours from Taba International Airport. Abu Gallum National Park lies to the north of Dahab. It is a protected national park area, marking one of the areas of Sinai where visitors become awestruck by its unspoiled beauty. With no hotels, shops, loud music or big crowds, this 400 square kilometers protected area is a place where one can experience true rejuvenation and indulge in the charming blend of the sand and the sea. 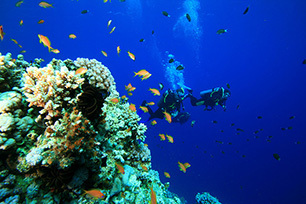 The park is home to a Bedouin settlement, and is a wonderful diving and snorkeling spot. 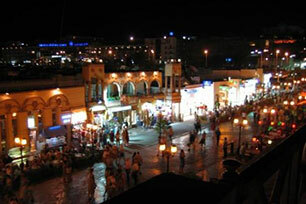 Assala, Dahab’s most developed city, is situated 2.5 miles up the coast from downtown. It is a sprawling conglomeration of palm trees, shops, campgrounds, hotels, bars, and restaurants that lie along the shore of Ghazala Bay. 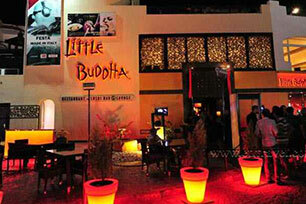 This city enjoys a distinctly bohemian feeling as it is less laid back and relaxed. 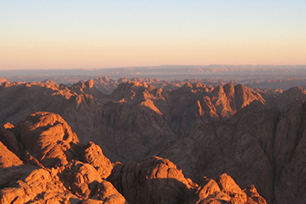 Mount Sinai consists of a group of peaks, often known as the Holy Mountains. However, it is also the biblical name of the peak on which Moses received the 10 Commandments. Mount Moses is considered to be where Prophet Mohammed's horse ascended to heaven, giving it religious significance to Islamic believers. The peak can be reached by climbing the steps leading up to the top, or by following a winding path that runs east from the monastery. The steps pass the Fountain of Moses. This exceptionally astounding valley is located 20 minutes away from Dahab, and it marks the ideal starting point for climbing Mount Sinai. Wadi Gnai is the place where sports’ enthusiasts find themselves, as it’s ideal for climbing, and magnificently suitable for bouldering. This valley is your entrance gate to a world of unlimited excitement, as it provides you with the chance to combine diving with a nice warm- up of trad climbing. 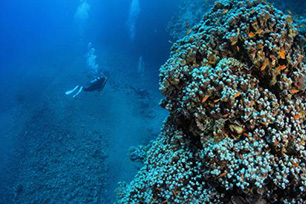 Dahab is characterised by shore diving with depths for all levels amongst the maze of coral islands. 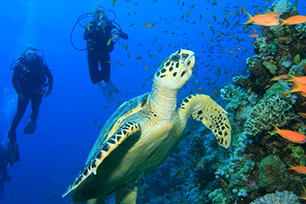 Marine life includes reef fish, jacks, snapper, barracuda and perhaps even turtles. There are gentle reef slopes and coral gardens for beginners and some more challenging sites such as the Blue Hole or the Canyon for the more advanced. 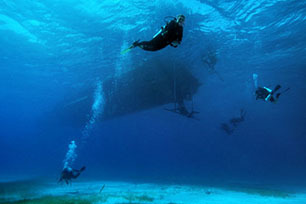 The Blue Hole is a seventy metre diameter hole in a reef table that has an archway in the bottom, leading to open sea. The Canyon is a channel that narrows at one end to become a covered tunnel. 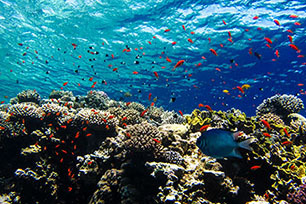 There are two marine parks in the Dahab region: Ras Mumlach, a seventy metre wall covered in hard and sot corals, and Ras Abu Galum, a wall with drop offs to over ninety metres. Eel Garden takes its name from the countless garden eels that carpet the sea floor not far from the entry point of the dive. After walking over the reef plate to the entry spot which is a nine meter canyon, it then broadens into a large sandy area that slopes down gradually. After diving along a jutting reef that lies perpendicular to the main reef the eels slowly come into view, waving to and fro in the current like synchronized swimmers who vanish back into the sand as you approach. Golden Blocks is a mix between coral gardens and sandy areas with almost all coral species represented. It has a coral slope with three sandy alleys in it. The first one starts at 10 meters and drops down to 30 – 40 meters. The second slope is like a small canyon with a beautiful little island of corals. At the third slope you will find an impressive gorgonian fan at 22 meters and beside it is a small cave. Shallower you have sandy areas with the 'Golden Blocks'. These are large coral blocks that go from 10 meters to the surface and are covered with anthias. 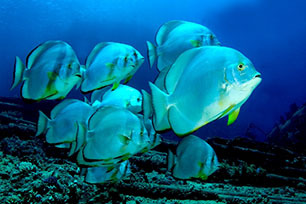 At Napoleon Reef you have a good chance of seeing the majestic Napoleon wrasses. 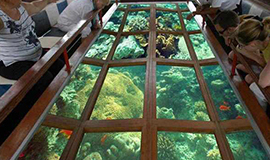 But this quiet dive spot also offers nice table corals and giant puffer fish that hide underneath the table corals. 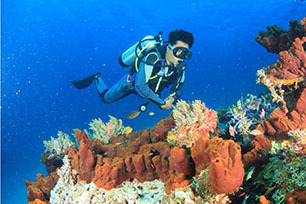 Napoleon Reef has a maximum diving depth of around 30 meters and is suitable for all divers. The average visibility is 10-20 meters, and access to the dive site is by boat, where the current carries you along a sandy ridge with many hard and soft corals. Fish abound, Eagle Rays make their quick appearances, Scorpion fish lurk and returning to the boat will go far better than Waterloo. The Canyon is a natural crack in the reef plateau, which descends to 54 meters, and its walls are 15-20 meters high. 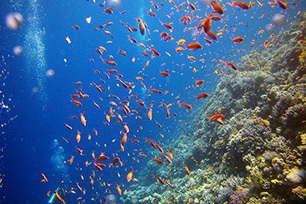 In shallower areas along the reef there is the possibility to see the rare Red Sea walkman, sea moths and garden eels. 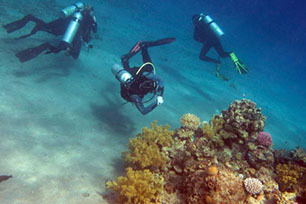 This dive is conducted either as an extended range or trimix dive. The dive site follows the reef round, with pinnacles and reefs providing a good variety of life, and it also makes a nice shore dive at night. It’s a very peaceful and quiet reef with all the beautiful reds that can’t be seen during the day. It is one of only 3 'blue holes' in the world, and Dahab's most famous dive site, opening to the Red Sea through a 26-meter long tunnel known as the Arch. The roof of the Arch lies at a depth of 52 meters, and the base of the Arch rests at 120 meters after which it plunges to 1000 meters. After an easy entrance through three sandy patches sunk into the coral, one finds a gently sloping expanse of hard coral stretching away into the blue. Fan corals rise up gracefully further down the slope below 20 meters. With little current and little obstruction it's easy to explore the corals cape and gaze at the inhabitants to your heart's content, or at least until your DM heads you back to the exit.